Kids in Southern California are still rolling around in hamster balls at the Bubble Fest 2018. The event will continue until April 8, 2018. Come and see the Bubble Lab, Water Spheres, Bubble Exhibits, and Mega Bubbles Courtyard. Are you a bubble lover? Learn about the science and mathematics of the amazing spheres. The show will exhibit surface tension, elasticity, air pressure, molecular, and geometric properties. Plan for a day of adventure, excitement, and surprises at Discovery Cube! Check for showtimes, ticket information, and directions. The Mega Show runs 4 times a day. 11:00 a.m., 12:30 p.m., 2:00 p.m., and 3:30 p.m.
from The Discovery Cube’s Bubble Fest! You don’t want to miss this event! What is the Bubble Fest? South Bay Galleria Mall’s list of amusements and activities. From riding boats, dinosaurs, and trains to rolling in inflatable balls on water. The fun never ends at South Bay Galleria. Let the fun times roll. All day family-fun adventure. Check all the Fun Things to do in South Bay Galleria with Kids below and make this 3-story mall your home for shopping, dining, and family fun activities. Emerald Events offers the best ideas for kids birthday parties. How’s about making use of your backyard and throwing a few tube rollers for the kids to bounce around in? This week Freida decided to bring the excitement to her backyard pool with giant Tube Rollers and the kids loved every minute of it! Emerald Events is notorious for delivering unique kids party supplies. Please shop our site for kids party ideas. 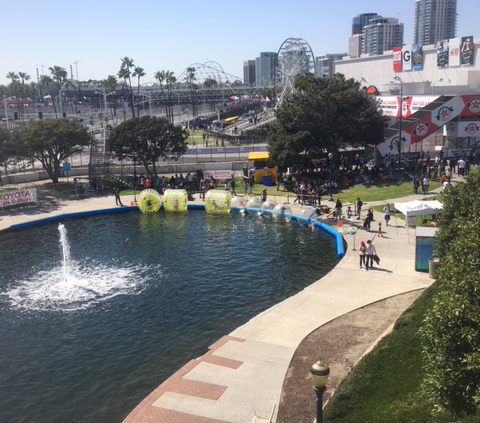 Bubble Rollers kids had a spectacular time at this year’s NHRA 2018 Finals! Emerald Events provided the rides for the kids and boy did they have a blast! 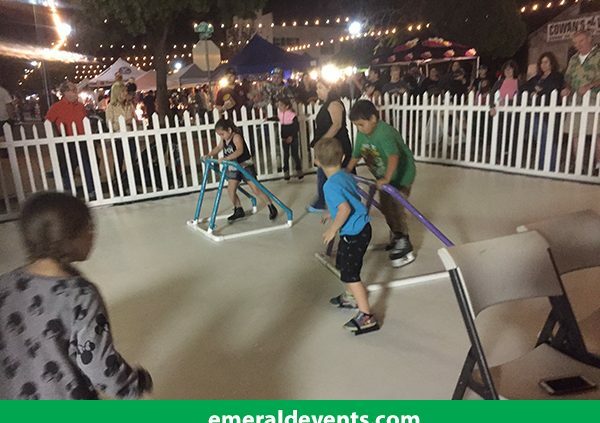 While Dad enjoyed watching the drag racing finals, the children took advantage of the carnival rides provided by Emerald Events. Thank you NHRA for inviting us to your event! We look forward to seeing you next year! Every year seems to be better than the last! Fun times! Book Bubble Rollers Rentals Today! Urban Sports LA teams up with the Bubble Rollers to teach you how to Play Bubble Soccer. Have you ever wanted to learn how to play Bubble Soccer? These cool party rentals are a blast for school events. Urban Sports LA teams up with The Bubble Rollers kids party supply store to show you how it works the video below. Rent and Play Bubble Soccer Ball Today! Our Bubble Bumper Soccer brings the excitement to any party, fundraiser, or event. Day or night, indoor or outdoor, birthday or large carnival! All of our party packages are fully customizable to fit any and all needs. All of our packages include our state-of-the-art bubble bumper suits, all necessary equipment including goals, cones, soccer balls and trained team members to construct a bubble bumper soccer field in your home’s backyard or local park and deliver you the best party experience possible guaranteed. Ask about our Bubble Bumper Soccer League! We are currently one of the best and fastest growing party companies in Southern California, from San Diego up to Santa Barbara and beyond! Thank you, Urban Sports LA for supplying the video. A synthetic ice rink was delivered and set up for Jefferson Liu, this Friday. Boy, does it look like fun! Jefferson Liu sure knows how to plan a party! The disco lights and dance music created a dance hall effect. 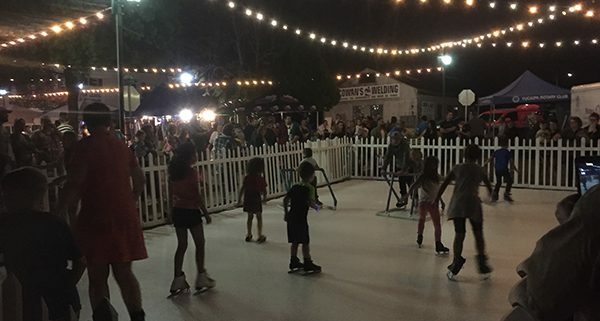 Ice skates were available for both adults and children to skate the night away. One thing for sure, Emerald Events will bring any celebration to life and Jefferson Liu’s event will be the talk of the town! Two party go-ers testing the mobile ice rink before the event kicked off. 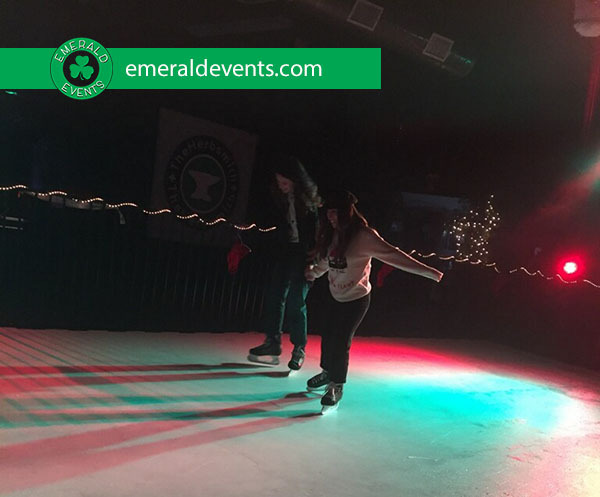 Our newest Mobile Ice Skating Rink brings the excitement of ice skating to any party, fundraiser, or event. Day or night, indoor or outdoor, birthday or large carnival! All of our party packages are fully customizable to fit any and all needs. 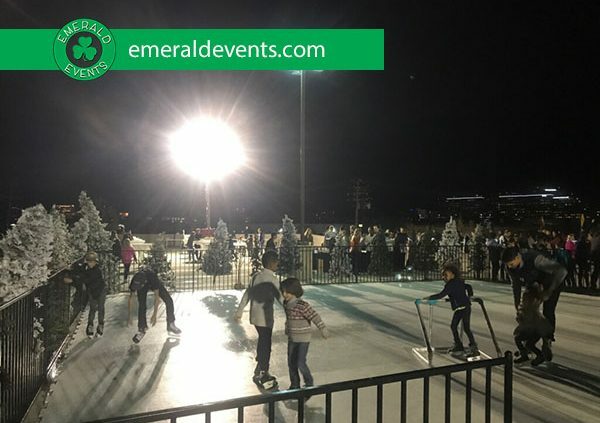 All of our packages include our state-of-the-art plastic polymer ice rink, various ice skate sizes, all necessary equipment and trained team members to construct an ice skating rink in your home’s backyard, school, office, street, or any firm, flat surface. We also deliver you the best party experience possible guaranteed. Book Synthetic Ice Skating Rink Today! Core Church LA sponsored a public event this month. The organization wanted to bring in the Christmas spirit by creating a winter atmosphere in Sunny California. But how does one go about doing that? 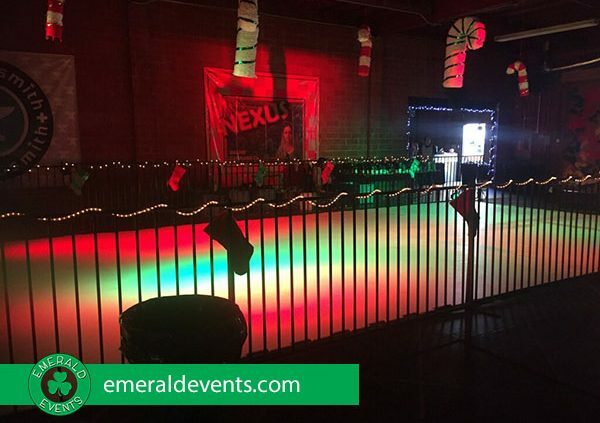 Emerald Events, of course! 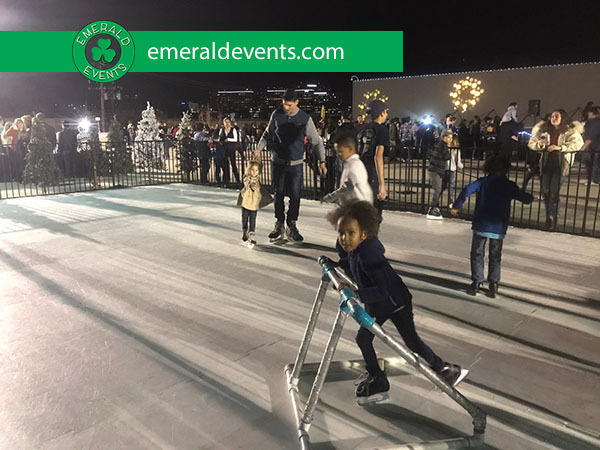 Emerald Events delivered the portable ice skating rink and created a Winter Wonderland in the middle of Los Angeles. How wonderful is that? The children slipped on the ice skates and skated their hearts content. If you are in search of ideas and fall short of ideas, try a portable ice rink. It’s the perfect solution for church events, block parties, corporate events, or kids birthday parties. One thing we know for sure, Core Church LA really knows how to excite the kids. It was an awesome night for family fun and entertainment.